The resolute growth and increasing popularity of virtual reality is geared to have a trans-formative impact on the events industry. It offers a unique experience that goes beyond attending a live concert, show or sports game – virtual reality technology provides an incomparable alternative for live entertainment enthusiasts everywhere. Virtual reality media has a considerable upper-hand over tradition media that we have grown accustomed to. The type of experience offered by virtual reality is an essential component of exceptional events, and because the technology is still new (to the mainstream) and a novelty, which a lot of people are curious and excited to experience, it has holds the potential of galvanizing the events industry. Creating a 360°perspective – capturing an event from many angles – translates to an exceptional experience, eliciting different responses and emotions as the audience gets to experience an event from new angles. Streaming 360° also presents an opportunity for staging products and brands. As one would expect. virtual reality means an incredible space advantage for organisers. Using VR, you can make a space appear much larger than it actually is. A single meter squared could appear as an entire arena. This is a significant consideration especially for trade fairs and road shows. Virtual reality is highly publicised in media presently, making it very popular with audiences in many market segments, which means it can be very effective in PR and viral campaigns. Virtual reality doesn’t physically transport you to an event, but suspends your perception of reality – convincing you that you are part of the event experience. There are only so many front row seats available for a particular sporting event or concert, and when one also takes in to account the increasing prices of tickets, virtual reality offers is a welcome alternative. Using virtual reality, more fans get to enjoy the front row experience. The 360° technology offers an experience and view, which being physically in the audience could never buy. Cameras are placed in locations beyond a front row experience (i.e. behind the goal post, on stage, etc. ), which translates to a unique experience for the viewer that cannot be compared to anything but reality itself. In 2014 NextVR released a Coldplay concert in VR that could be viewed using the Samsung Gear VR headset, proving the value of virtual reality in other areas besides just gaming. 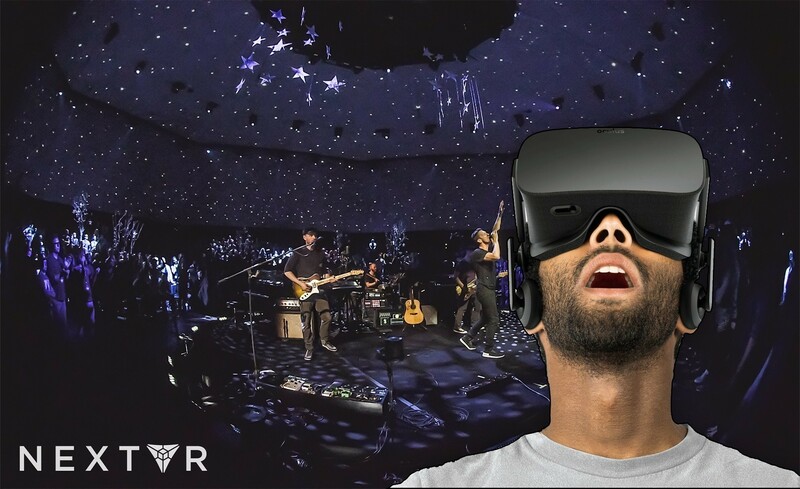 The Laguna Beach, California based technology company shot the entire concert in VR and a clip of the first song, A Sky Full of Stars, was made available via the NextVR app, which was accessed in conjunction with the release of Samsung Gear VR headsets. Fans of the band, and all those who are curious about virtual reality movement, were able to playback the concert as a virtual reality experience. In this way, fans had a hyper-reality experience that was intended to be better than being in the audience. Through the use of VR, audience were put right in the middle of the action, as if they were on the stage with the band members. According to NextVR the concert film was the first ever broadcast quality VR experience. The trend of broadcast virtual reality experience has not slowed down since. VR has grown to become even more popular, and its uses and possible application are pushing boundaries and placing the technology in a position in which it could completely revolutionise a number of industries and how we experience live events. Virtual reality technology has also been used in sporting events to improve the audience’s experience. There are available systems that allow sports spectators to walk around a stadium or other sporting location. This helps them when purchasing a ticket to an event. You also get virtual reality games that have a sports theme which allow for players to be actively involved in competitions. For instance, you get an interactive football game that projects a match (that a players are competing in) onto a real world surface. In the next few years, we could see virtual reality being firmly established in the events industry. As the technology continues to improve and virtual reality content becomes readily available to the audiences, virtual reality will continue to redefine how content is consumed. Virtual reality technology also presents an opportunity to attract new audience attention as there are relatively simple and affordable options that deliver the virtual experience, such as the Google Cardboard. Virtual reality will mean that fans have the opportunity to make their dreams come to true. For those who are unable to make it to an event, for whatever reason, they will still get to experience the festivity. Below is one of the events that we have captured in 360° Virtual Reality. We filmed the complete venue in 360° panorama images in 2011. Today visitors to the Johannesburg Motor Show can still experience the event as if they were actually there, by walking through the Johannesburg Motor Show in virtual reality. You can watch the Virtual Tour on your Desktop, Smartphone or with your Google Cardboard, Oculus Rift or Samsung Gear VR Headset.